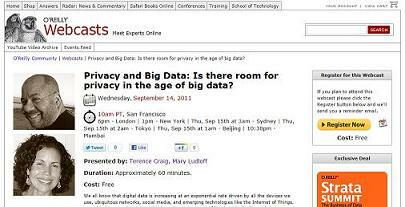 As you all know by now, our book on Privacy and Big Data is on its last lap! We are now prepping it for production and at the same time, getting ready for an O’Reilly Webcast featuring Terence (and yours truly) discussing the state of privacy in the age of big data. In the Webcast, we promise to ask and answer this question: What level of privacy do you really have in the age of big data? Since it’s free (and the book isn’t) we encourage all our blog and twitter followers to attend. We will be dealing with some contentious topics head on and will let you in on a closely held secret: where we agreed to disagree on the state of privacy today. We talk in the book about how unsurprising it is that privacy debates often devolve into shouting matches and although we never actually shouted, there were some interesting discussions that usually began with, “With all due respect…” That being said, at the end of the day we were both happy with how the book turned out and look forward to hearing your views during our Webcast! To register for the Webcast, go here. And for those of you who read my latest post on what it was like writing this book with my esteemed co-author, yes, my headshot was approved by me! Finally, for those of you wondering when Terence will weigh in on his writing experience, stay tuned as his post will go up next week. Entry filed under: General Analytics. Tags: analytics, big data, data privacy.